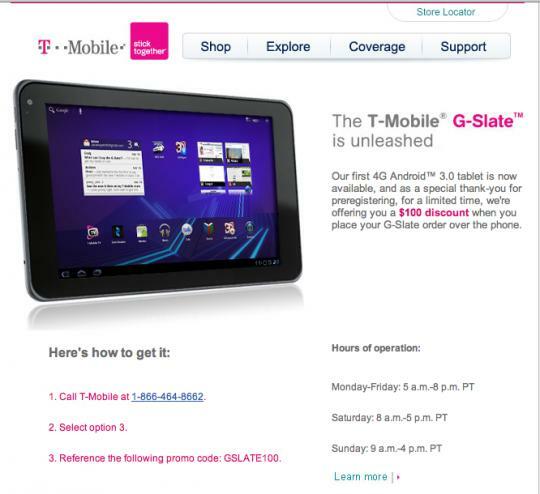 T-Mobile G-Slate gets an $100 discount. Hurry up! We found out some really good news for you guys! T-Mobile is offering a $100 discount on a two year contract but only if you purchase the LG G-Slate and data plan before April 27th. 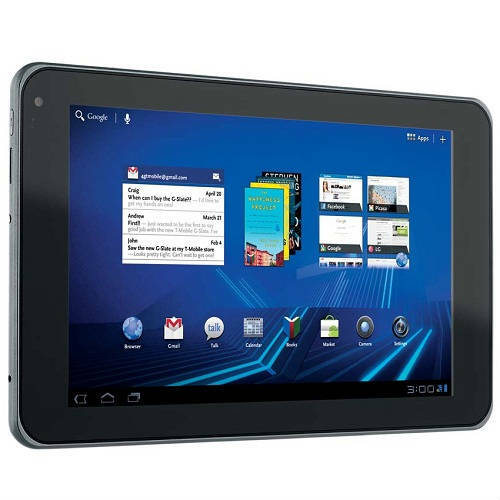 LG G-slate is not only the first 4G tablet from T-Mobile, but is also the fisrt tablet will Android 3.0 tablet with 3D screen and dual-core Tegra 2 processor The G-slate tablet features 8.9 inches with 768 x 1280 pixels resolution and multi-touch support. G-Slate tablet is powered by a 1 GHz dual-core Tegra 2 processor, has dual 5 megapixels cameras for 3D videos and photos and can show 3D movies, without using any 3D glasses. The tablet is capable to record videos at 1080p resolution with 24 fps (2D) and at 720p resolution with 30 fps (3D). Also, G-Slate tablet has another front-facing camera for video-calls. It’s capable of recording in 1080p HD video and can also show 3D movies. If you’re convinced and want to order the LG G-Slate, you have to call T-Mobile directly at 866-464-8662. Select option 3 and use the promo code GSLATE100. The phone hours of operation are Monday-Friday 5am-8pm PT, Saturday 8am-5pm PT, and Sunday 9am-4pmPT. So, hurry up because if this “secret deal” gets too popular in a short time, it may get pulled because now it’s the worst kept secret on the web.